Remote sensing is a method to acquire information about an object or phenomenon, defined as a target, without making physical contact with it. This technique is one of the most growing approaches in Earth Science disciplines thanks to its quite inexpensive and time-saving capabilities. Active: the sensor emits and receive the electromagnetic radiation with their own light source and independently by the weather conditions. Indeed, they have night-and-day and all-weather capabilities. RADAR (radio waves) and LiDAR (laser light) are examples of active remote sensing. Passive: the sensor needs a light source, typically the Sun, to emit the radiation and is subjected to the presence on clouds in the atmosphere. Examples of this kind of sensors are meteorological, optical or infrared systems. We apply both active and passive systems to investigate geological and environmental processes, such as earthquakes, landslides, subsidence, etc. Passive systems allows to recognize and classify vegetation, urban vs wet regions, and geological formations; while active systems are used to detect ground deformations with high precision (order of few millimetres). Our research group is familiar with optical images taken from satellites (as the most recent Landsat 8) and Unmanned Aerial Vehicles (UAV) for multi-spectral investigations, thematic maps formation, and 3D point clouds modelling. Another field of expertise is the use of satellite-based multi-resolution SAR images (as Sentinel-1 and Cosmo-SkyMed) to form differential interferograms for DInSAR analyses and precise ground displacement measurements. 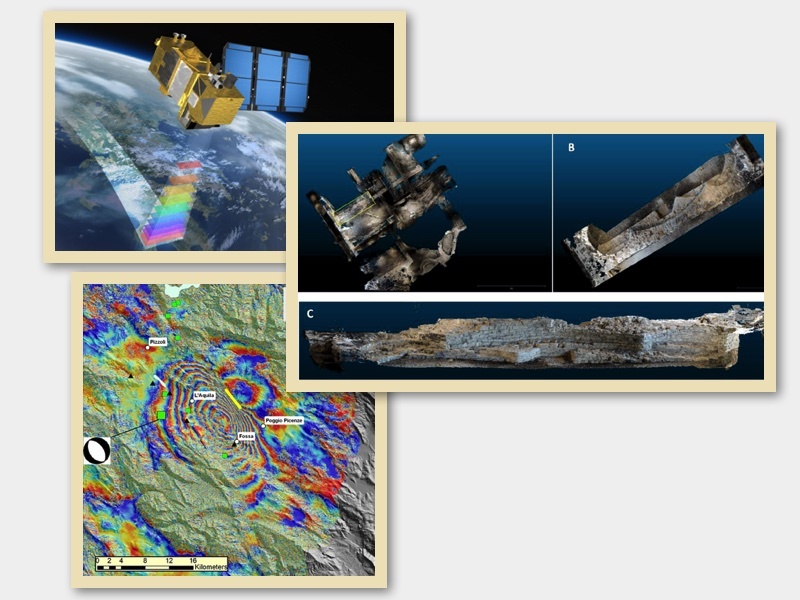 On the left-top: Sketch of multispectral image acquisition from an optical satellite. On the left-bottom: Example of interferogram formation after 2009 L’Aquila (central Italy) earthquake (credits: INGV and ESA). On the right: Archeoseismology in Como (northern Italy) at the Roman baths. Taking measurments of a bent wall using 3D models from structure from motion.